Last week we had soccer lunches, a ferocious T-Rex, a kitty who keeps the peace and a mom who went on a lunch-packing strike. 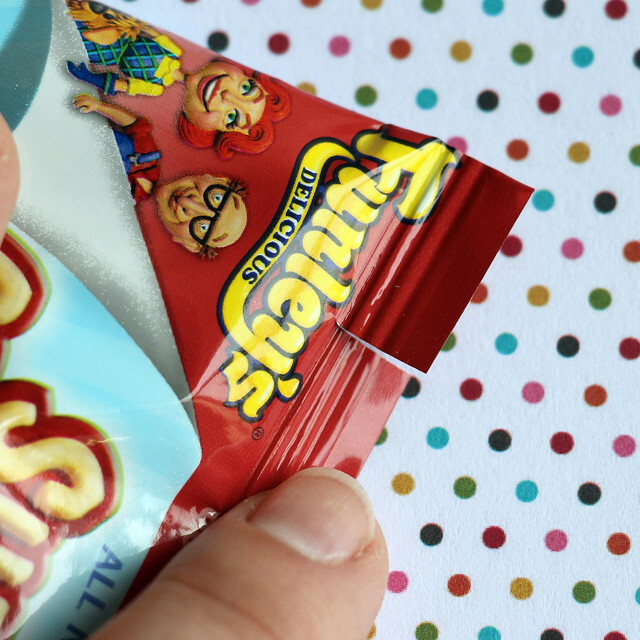 There’s a handy dandy tip for helping younger kids with hard to open packages, too. Oh, also I’ve started a newsletter and I encourage you to subscribe to it. I’ll be sending tips, tutorials, recipes and other fun stuff every other week. 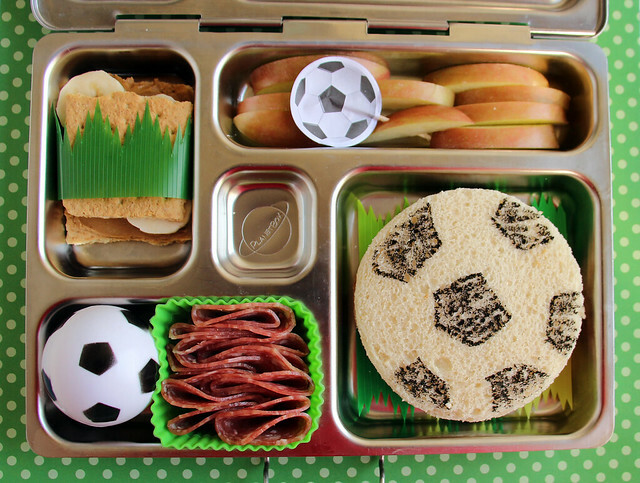 I decided to kick off Monday with a couple of soccer lunches! Kick off! Get it? Har har har! 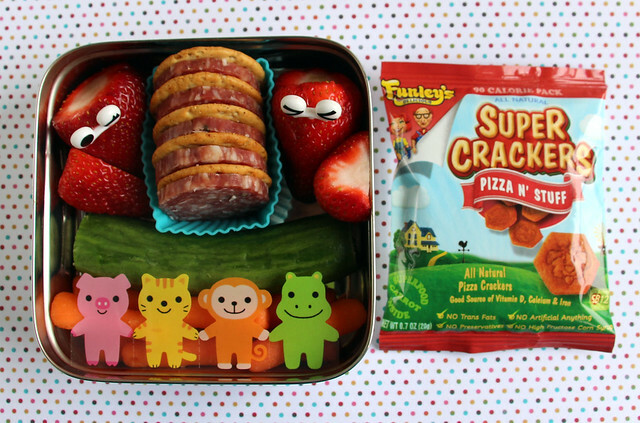 First up is the lunch I made for my preschooler, Augie. I started wih a special treat to make his Monday a little brighter: a graham cracker sandwich filled with cookie butter and banana slices. Yum! I wrapped it up in an extra-long piece of sushi grass to emulate the grass on a soccer field. I also gave him apple slices on a paper soccer cupcake pick, a soccer ball “Easter Egg” that I filled with cheddar bunnies, a square silicone cup filled with salami slices and a soccer ball pb&j set on a bed of reusable silicone sushi grass. To make the sandwich, I used one of the extra containers that comes with the PlanetBox Rover to cut two circles from bread. That ensured that the sandwich fit perfectly in the space. I then assembled a peanut butter and jelly sandwich like one normally would. (I’m guessing you’ve got that down pat.) Finally I used a food-safe marker to draw black pentagon shapes on the top of the sandwich. 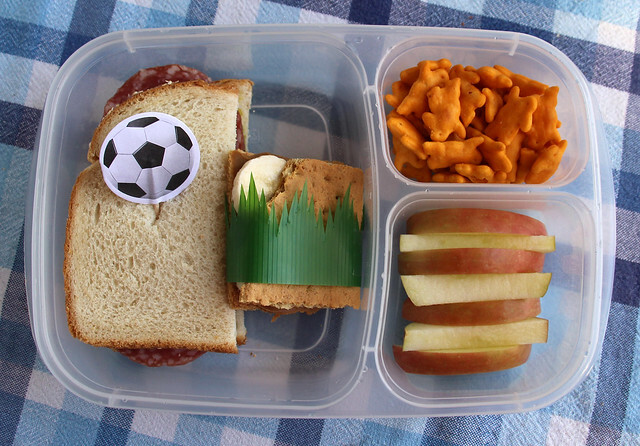 They weren’t perfect, but I think they got the idea across OK.
My fourth grader, Wyatt, is less inclined to let me decorate his lunch, so the soccer stuff was toned down in his lunch box. He had a salami and pesto sandwich, the same graham cracker, cookie butter and banana sandwich wrapped in the same long sushi grass, cheddar bunnies and apple slices. This was packed in an EasyLunchboxes bento box . This was what was left of Wyatt’s lunch after he came home. He ate the apples and picked the salami out of his sandwich. Unfortunately, it’s pretty typical for his lunches to come home with barely any food gone and I’m pretty frustrated. I can’t STAND throwing food away and the sandwich and the cookie snack were completely inedible because he purposely mixed them together. So as of last Monday, I’m going on a lunch-packing strike and making him eat at school. He doesn’t like school lunches and I would much rather feed him food from home, but if it’s all going in the trash anyway, he can toss the school’s food and save me the trouble in the mornings. I’m hoping he’ll come around soon and agree to start eating his lunches again, but until then there will be no 4th grade lunches around these parts. 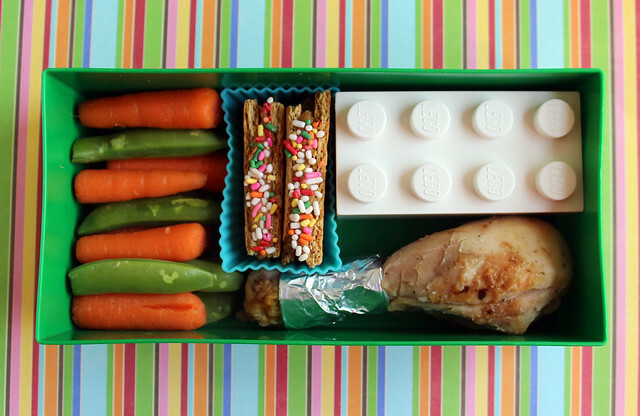 On Tuesday, I packed Augie’s lunch in our green Lego bento box . He had carrots and snap peas, a chicken drumstick, crackers (in the smaller white Lego box ), and cookie butter and graham cracker sandwiches with sprinkles pressed into the edges. I put the graham crackers in a rectangular silicone cup to help keep them from getting soggy. 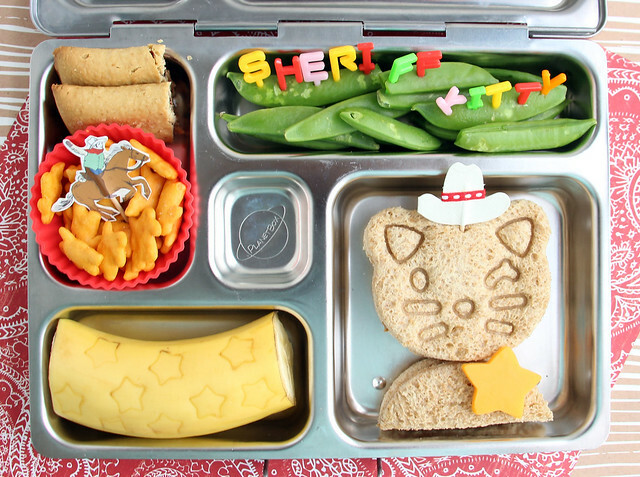 On Wednesday, he had the Sheriff Kitty lunch from the 3 Tools, 4 Lunches post I put together last week. You can read more about this lunch over there. 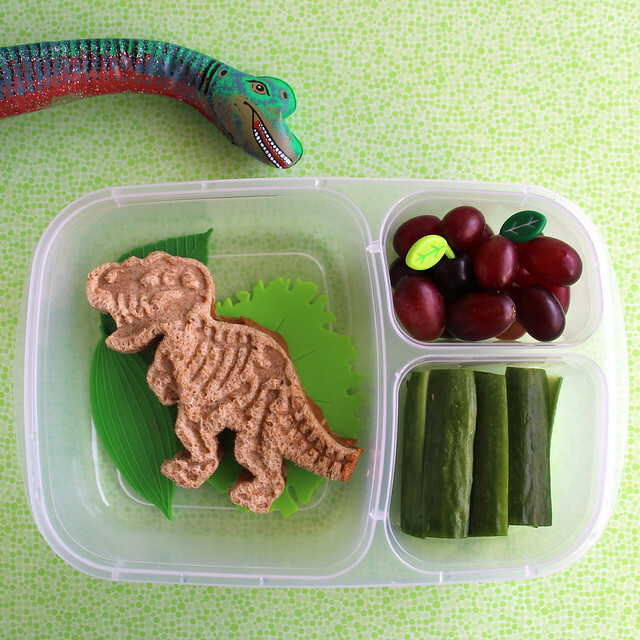 I packed this ferocious dino lunch into an EasyLunchboxes bento box . He had a T-Rex pb&j, grapes and cucumber sticks. The sandwich was made with this cool cutter and though the grapes were supposed to be dino eggs, I forgot and jabbed some leaf picks into them instead of putting them in the cucumber sticks where they were supposed to go. Oh well. Friday, Augie had strawberries (with eyes! ), crackers and salami, a Persian cucumber, and carrot sticks with a piece of decorative baran to make the lunch a little cuter. We received a huge box of snacks to sample from Funley’s Delicious on Thursday afternoon so I let Augie pick any snack he wanted from the box (crackers, granola bites and Stix in the Mud candies) and he chose the Pizza ‘n’ Stuff Super Crackers. Quick Tip: sometimes Augie has a hard time opening packages of crackers, granola bars and things along those lines by himself. He’s too shy to ask his teachers for help so he doesn’t eat his treat at school. If I take 5 seconds to cut a small slit in the package before putting it in his lunch bag he can tear it open by himself! I did this on Friday and it worked like a charm. 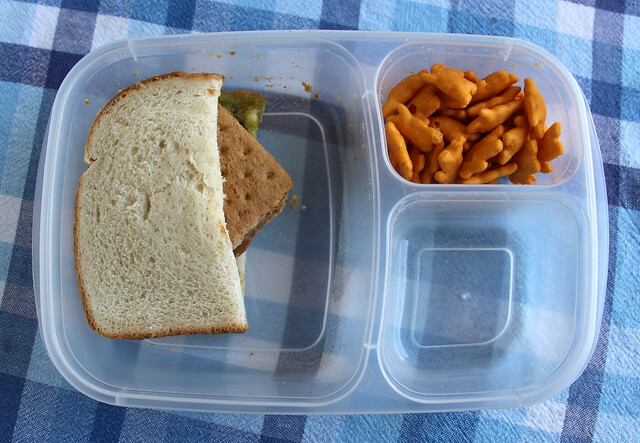 Are you looking for more ideas for packed lunches! My book, Everyday Bento: 50 Cute and Yummy Lunches to Go is packed with ideas for fun, delicious lunches. With 50 brand new bento box lunches and step-by-step photo tutorials showing how to make them it will provide you with loads of inspiration when it’s time to pack lunch. Order today from Amazon , Barnes & Noble and Powell’s.